The TJ community is buzzing with excitement for the upcoming ArtFest. 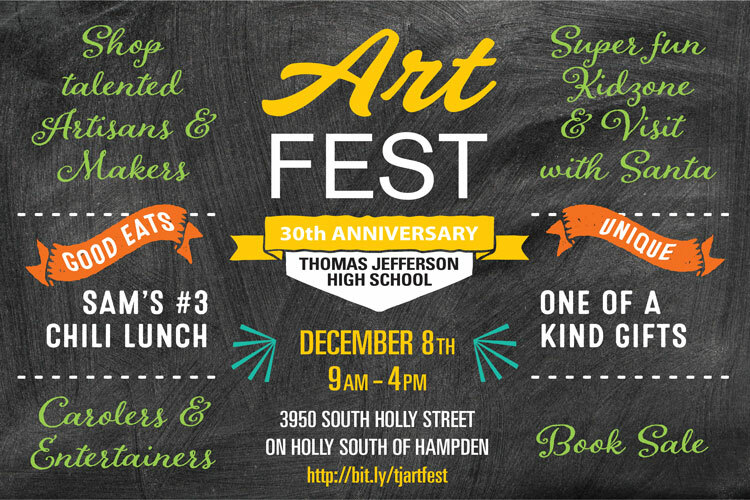 Thomas Jefferson High School honors a 30 year tradition by once again hosting the ArtFest this December. For the past three decades, Thomas Jefferson has held an arts and crafts fair that showcases local artists and artisans from the Denver Southeast community. “ArtFest started as a craft fair 30 years ago and has grown into a quality, holiday art and artisan festival to rival some of the best holiday markets around,” explained Spring Hericks, TJ’s PTO Co-President. At the ArtFest, community members can enjoy the holiday season by participating in the fair, which offers something for everyone. Attendees can find unique holiday gifts, browse new and used books for all ages in the book sale, attend a book signing with various local authors, and indulge in delicious treats. The ArtFest also offers a Kidzone, live entertainment, and an opportunity to visit with Santa, so the entire family is promised to be entertained. Students at TJ are encouraged to get involved in the festival. Many groups of students will participate in the ArtFest through their clubs or classes. Choir students are scheduled to perform at the event and students in SkillsUSA will participate in the chili fundraiser that is offered by Sam’s #3. Spartans not in a club can also volunteer their help with the ArtFest. They can help set up and break down the event, help kids in the Kidzone make art projects, or volunteer as Santa’s elves. Spartans who volunteer with their club can earn $10 per hour for their specific organization for setting up and tearing down the event. This year is the ArtFest’s 30th anniversary, which will add to the excitement regarding the event. This year will also provide new additions to the festival. “We always have new artisans each year so mark your calendars to come check it out,” voiced Hericks. Furthermore, the ArtFest will be supported by new vendors, including CP Paper Flowers and Jewelry, and Glass Menagerie. Some crowd favorite vendors will also be making a welcomed return. Creative Harmony Designs, a metal artwork company, Hanson’s Home Wood Design, and My Sweet Honeybee, a company that hand crafts soaps, will all be popular upon their return. The event further includes the community by incorporating vendors from around the TJ neighborhood and even vendors from the school. Michael Palmieri, TJ’s Drama teacher, will be making his contribution as a vendor with his own company, Virtual Light Imagery. Will Forrester, the Photography teacher at TJ, is also participating by selling and framing student’s photography. The photos will be priced depending on the size and the profits earned will be used to help fund the Photography program at TJ. Another faculty member, Amy Kalinchuk, will be hosting her own booth featuring locally handcrafted soap products and made from natural and organic ingredients, through her company, Old Crone’s Bewitching Bath Soap. Even some TJ parents plan to get involved. John Trujillo is a supportive parent who will be featuring his functional ceramics from his company, Trujillo Pottery, at the festival. Those who are interested in attending this beloved TJ tradition are guaranteed to have an exciting day at the ArtFest. The event takes place on Saturday, December 8th from 9:00 a.m. until 4:00 p.m.. The author signings will take place the entire day starting with April Leo and ending with Sunny Weber. More than ten authors will be signing books, each of them filling a two hour time slot. The Kidzone activities are facilitated by TJ’s National Honor Society (NHS) students and a visit with Santa from 2:00-4:00 p.m. There is no doubt that this treasured event will once again be a success as Spartans and community members alike look forward to the fun filled day. For the most up to date schedule of all the events at ArtFest, please check the website.